consistent conformed to international and national standards, we gained worldwide market, Product quality and service reliability are essential to the success of our business, then we stricly control every procession such as the purchasing of raw material, the development of innovative designs and the advanced cheking method and so on, we consider it is our company�s life to give every customer fully satisfaction. Products range: gate, check, globe, wafer check, bellow sealed, ball, safety, butterfly, plug, ect. Operation type: manual, gearbox, chain wheel, pneumatic, electronic, hydraulic-pneumatic etc. Connection End: RF, BW, SW, NPT, wafer type, etc. Materials (casting): WCB, WCC, LCB, LCC, LC1~3, CF8, CF3, CF8M, CF3M, CF8C, CN7M, CA15, C5, WC5, WC6, WC9, GR4A, etc. Materials (forging): A105, LF1, LF2, F11, F22, F5, F304, F304L, F316, F316L, F316H, F321, F347, F51, F60, etc. According to the different project and different valve range which used, we effectively meet customer�s requirments with RT, UT, MT, PT test standard. Anyway, pls kindly reply me if you saw this email. Your any reponse will be highly appreciated. 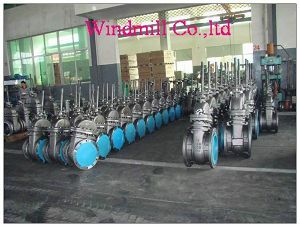 Company Name: Wenzhou Windmill Valve Co., Ltd.